The Japan International MANGA Award, hosted by the Ministry of Foreign Affairs of Japan, recognizes manga artists who have made a contribution to the spread of manga culture overseas. 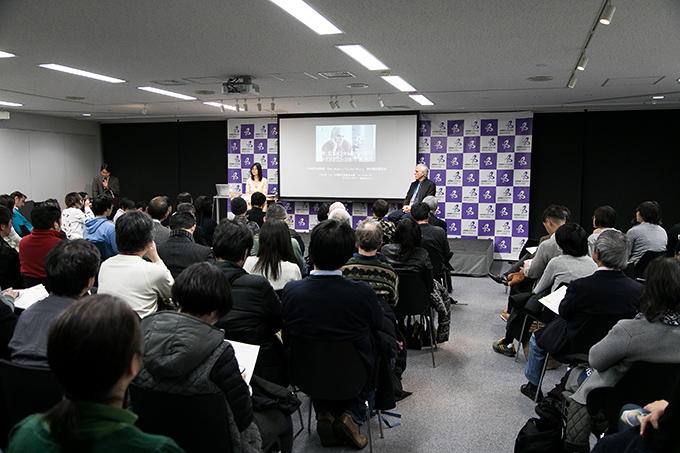 The Japan Foundation hosted a lecture by Frederik L. Schodt , one of the leading translators of Japanese manga, who was invited to the 10th awards ceremony for the MANGA Award held on February 6, 2017. 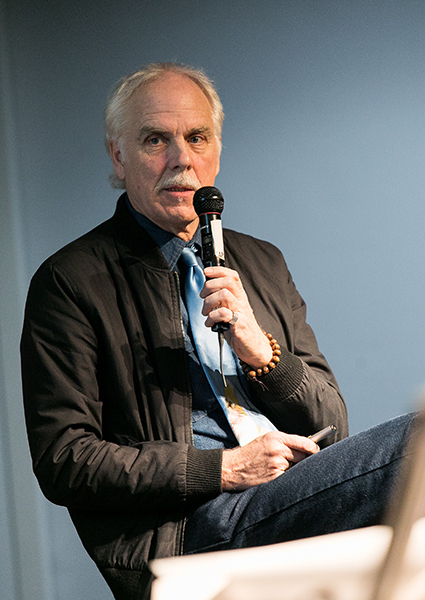 Schodt has worked as a manga translator for over 40 years, ever since he developed a fascination for Japanese manga, and he also interacted directly with legendary artist Osamu Tezuka. In 2016, the English edition of The Osamu Tezuka Story, translated by Schodt himself, was published by Stone Bridge Press in the U.S. (aided by the Japan Foundation's Support Program for Translation and Publication on Japan). 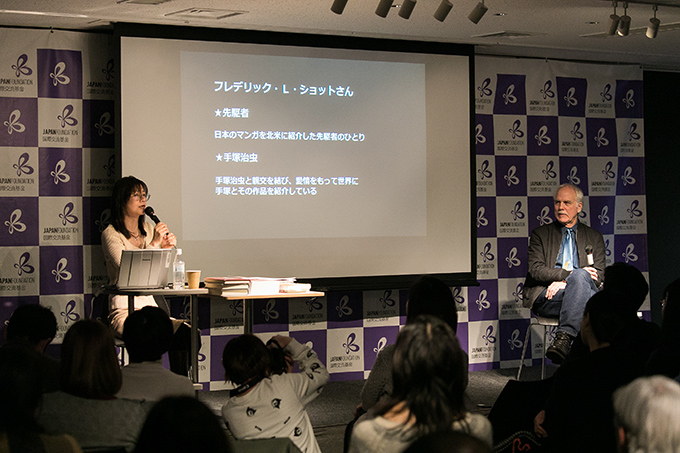 During the lecture, moderated by Yukari Shiina (a translator of U.S. comics, manga researcher, and major fan of Schodt), he spoke of his passion for translating Japanese manga and his love for the works of Osamu Tezuka. Schodt became interested in manga culture long before Japanese comics, known throughout the world today as "manga," even became popular overseas. 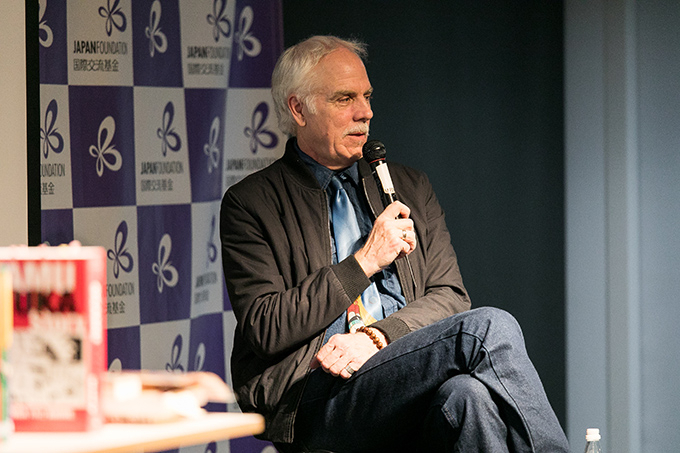 Through translation and critical review, he has spent many years introducing leading manga works to the U.S. His own introduction to Japanese manga dates back to 1970. Moderator Yukari Shiina (left) introduced Frederik L. Schodt's extensive background. Shiina: You have several different titles, including author, manga critic, and translator. Schodt:Some may think I'm a suspicious character because my work is too wide-ranging (laughs). Shiina:In other words, you are engaged in numerous types of work. Today, to commemorate the publication of the English version of The Osamu Tezuka Story, I'd like to focus on two points, which are your role as a pioneer in introducing Japanese manga to North America, and your role as a translator with deep ties to Osamu Tezuka. First, let me introduce your background. You were born in Washington DC in 1950, where you lived until the age of five. Schodt: That's right. I lived outside the U.S. after the age of five, in places such as Norway for five years, and Australia for five years. I first came to Japan in 1965. Shiina: And at the time, you were not reading Japanese manga yet, correct? Schodt:I was in Japan from 1965 until I graduated from high school in 1968, but I wasn't reading manga. I could not understand Japanese and, oddly, I have almost no memory of seeing them then. Shiina: It wasn't until university that you started reading Japanese manga? Schodt: I went to a university in the U.S. after graduating from high school in Japan, and then came back to Japan as an exchange student in my third year to study Japanese intensively at the International Christian University (ICU). At the time, manga were just becoming popular among university students, and almost all the students around me were reading them. I thought it was an interesting phenomenon, and began reading them myself. After about one year as an exchange student, a college friend came over to me and handed me a paperback manga saying, "You're going to love this!" He also said, "Make sure you give it back!" 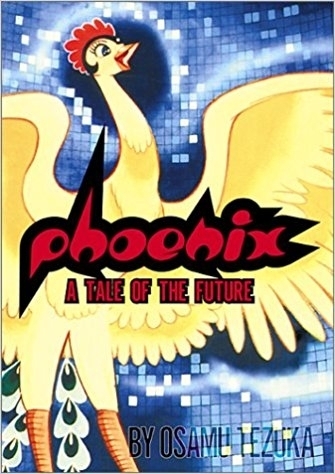 as he lent me Phoenix by Osamu Tezuka reverently, as if he were letting go of a cherished treasure. I felt as though I were being handed something sacred (laughs). I read it right away. It was full of things I had been mulling over and thinking about in my impressionable 20s, such as the meaning of life. I thought Phoenix was amazing. I was instantly captivated. In other words, I became addicted to manga. That's when my life took a strange turn (laughs). Schodt explains how his life took a strange turn when he discovered Phoenix. After encountering Phoenix--recommended by a friend while he was an exchange student at a Japanese university--Schodt went on to become a professional translator and translated several manga by Tezuka. The first work he translated was, in fact, the very work which launched him on this path: Phoenix. Shiina: You helped establish a Japanese manga translation group called Dadakai as a result of becoming captivated by Japanese manga. Schodt: I came back to ICU as a postgraduate to study interpreting and translation after studying there as an exchange student. Then I became a professional translator in Tokyo after I completed the postgraduate program. Around that time, some friends from my ICU days (Jared Cook, Shinji Sakamoto, and Midori Ueda) and I formed Dadakai to introduce Japanese manga overseas. While I don't think I was the one who came up with the idea for the group, considering my lack of entrepreneurial spirit, I was probably the one who named it as a pun. 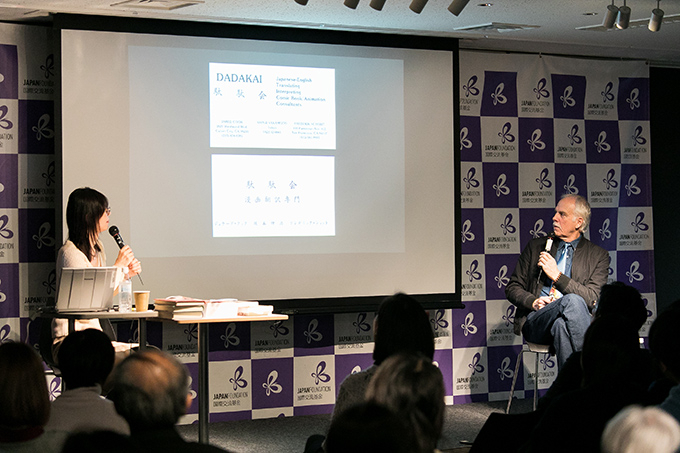 Schodt established Dadakai with friends to introduce Japanese manga overseas. Shiina:Right after establishing Dadakai, you approached Tezuka Productions to promote your desire to translate Phoenix. Schodt: Not just myself, but everyone in Dadakai loved Phoenix, so three or four of us visited Tezuka Productions to ask for permission to translate it. Not one of us expected to be able to meet Tezuka himself, but Tezuka suddenly appeared while we were talking to (Takayuki) Matsutani, his manager at the time and the current president. He was someone we worshiped, so I was both surprised and deeply moved. As a result of the meeting, Dadakai went on to translate volumes one through five of Phoenix, which we delivered in a draft form to Tezuka Productions. That was around 1977 or 1978. Then our translation collected dust in the archives of Tezuka Productions for about 25 years. Shiina:So this is how your career as a Japanese manga translator began. You also developed a closer relationship with Osamu Tezuka, serving as his interpreter whenever he visited the U.S., and you also published a book introducing Japanese manga in the U.S. called Manga! Manga! The World of Japanese Comics. And this was in 1983, before Japanese manga fully arrived on American shores, wasn't it. Schodt: That book, by the way, was published with help from the Japan Foundation's Support Program for Translation and Publication on Japan. But I think we published it a bit too early. It probably would have sold more if we had released it 10 years later (laughs). Shiina:Your book won the 2nd Manga Oscar Special Award at the 1983 Comic Exhibition held from 1981 to 1983 by the Japan Cartoonists Association and Nippon Broadcasting System. Schodt: And it was none other than Tezuka Osamu who wrote the preface to the book. He even participated in a book signing to celebrate the publication, held at a bookstore in Tokyo. The line at the venue that day was extremely long, but of course they had all come for Tezuka's autograph, not for me. He would also always add an illustration when he signed his autograph. That was the first and last time I would ever sell that many books in one day (laughs). In 1987, after Manga! Manga! 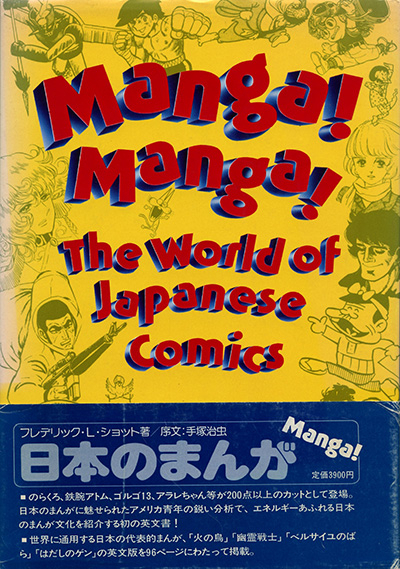 The World of Japanese Comics was published, Eclipse Comics and VIZ Communications (now VIZ Media and a subsidiary of Shogakukan, Shueisha, and Shogakukan-Shueisha Productions), entered the U.S. market to publish such works as The Legend of Kamui, while almost at the same time, First Comics, then located in Chicago, published Lone Wolf and Cub. This was the beginning of full-scale commercial publication of Japanese manga in the U.S.
Shiina:One work which cannot be ignored when discussing the state of Japanese manga in the U.S. is Ghost in the Shell, by Masamune Shirow, which you translated in the 90s. At the time, Ghost in the Shell was described as a model for publishing Japanese manga in the U.S. due to the high quality of the lettering and onomatopoeia of the English edition. Your translation was also highly praised by fans. Schodt: Some of the fans told me they were impressed that I was able to translate Shirow's Japanese at all. Shirow's works include numerous in-jokes and complicated puns, which makes it difficult to translate. Shiina:Then, in the 2000s, the 23 volumes of Astro Boy and the 12 volumes of Phoenix were finally published in the U.S. almost simultaneously. Schodt: Actually, I visited VIZ Media once in the mid-1990s with Matsutani-san from Tezuka Productions to sound them out on the idea of publishing Phoenix. But at the time, there was still only a narrow interest in manga in the U.S., so it was impossible. Conditions became ripe finally in 2002, when the market expanded, so VIZ at last began publishing the work. They first published the five volumes we had translated and submitted, as Dadakai to Tezuka Productions in 1977 and 1978; then, Jared Cook and I were able to translate the remaining seven volumes of Phoenix, thus completing everything that Tezuka had created for the series. The 12 volumes of the English edition of Phoenix were published between 2002 and 2008. Shiina:The English edition of Astro Boy was also published in 2002. Five years later, in 2007, you wrote The Astro Boy Essays, a collection of essays on Osamu Tezuka and Astro Boy. In the introduction, you wrote that though people had approached you for many years about writing a book about Osamu Tezuka, you did not feel you were ready, but that you were able to deepen your understanding of him through translating the 23 volumes of Astro Boy, and felt you could finally write the book. Schodt:Yes, I kept rejecting the idea because not only has Tezuka written so many works, but because the breadth of the genres he covered is so vast. I thought it would be impossible to write about him in a single book. But after translating all volumes of Astro Boy, I began to think I might be able to write a single volume about him if I focused on Astro Boy alone. 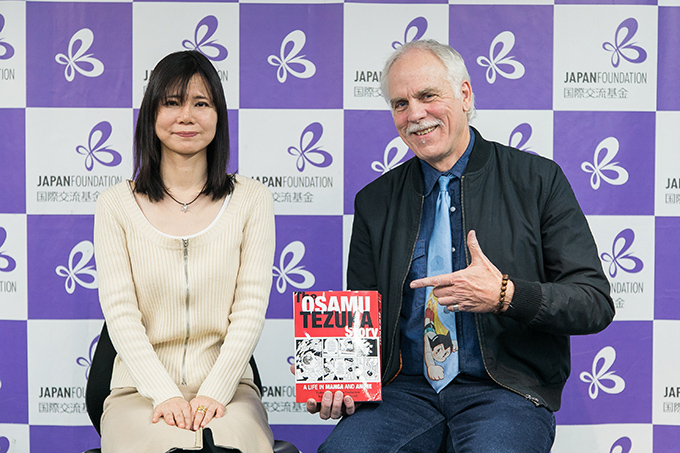 As the person most knowledgeable about Osamu Tezuka and his works in the U.S., Schodt translated all 904 pages of the first and second volumes of The Osamu Tezuka Story. This major work, first published in paperback in 1992 by Asahi Shimbun Publications, was written as a biographical manga of Osamu Tezuka by Toshio Ban, a manga artist at Tezuka Productions at the time, and other production staff members, featuring numerous episodes from Tezuka's life. The English edition translated by Schodt was published by Stone Bridge Press in 2016. 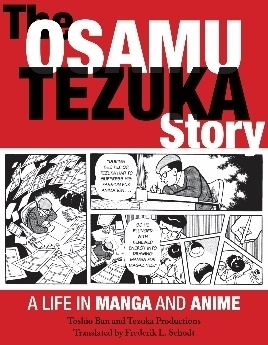 The English edition of The Osamu Tezuka Story was also a major work at 928 pages. Shiina:Now let's talk about your latest work, as a translator of The Osamu Tezuka Story. This book was also published with support from the Japan Foundation's Support Program for Translation and Publication on Japan. Schodt: The Japan Foundation has done a great deal for me over the years (laughs). Shiina:The original Japanese edition is 904 pages, compared to 928 pages for the English edition. Schodt:The structure of The Osamu Tezuka Story is really interesting, making good use of old documents, so it was a great source of learning and discovery for me. In Japan, it fits under the category of "information manga," a genre which doesn't really exist in the U.S. Books in the U.S. are read from left-to-right, so at first I thought it would be better to publish it that way to encourage as many Americans to read it as possible. However, the work was originally designed to be read right-to-left, and considering that young American manga fans are getting used to reading manga from right-to-left, we decided to publish it that way, like it is in Japan. Shiina:I've actually also felt that a left-to-right format should be used to make it easier for Americans to read the books. But the situation for each work is different, so the decision to publish either in a left-to-right or a right-to-left format is unavoidable when issuing a translation. I'm told you also struggled in other ways when translating The Osamu Tezuka Story, such as the translation of the mob scenes (crowd scenes). Schodt:That's right. The mob scene is one of the expressive techniques that Tezuka uses in his manga. For example, Metropolis, published in 1949, is one of his early works with memorable mob scenes. Miniature panels from this same work are also included in The Osamu Tezuka Story, and I made my eyesight worse by using a magnifying glass trying to read the tiny Japanese text (laughs). Shiina:I know what you mean. It's really a challenge for translators. But the biggest obstacle for you was the chronology at the back of the book, wasn't it? The chronology alone takes up 45 pages, and features not only every manga, TV animation, and theatrical animation, but even release information for things such as New Year's greetings cards and calendars by Tezuka. And you translated all of it, didn't you? Schodt:Peter Goodman, of Stone Bridge Press, the publisher of the English translation, warned me that nobody would read the entire appendix even if I translated it, but I did so anyway, just to be faithful to the original, and in the spirit of professional translation. That caused my chronic shoulder pain to come back, and it still hasn't completely gone away. If anyone has an opportunity to read The Osamu Tezuka Story, do me a favor and please take a look at the appendix as well (laughs). 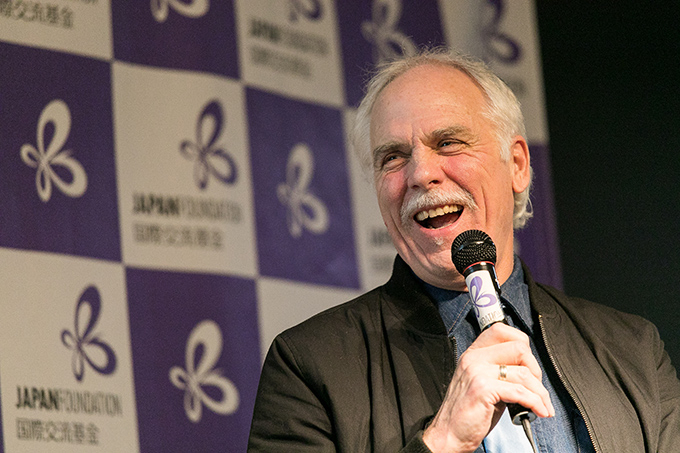 Frederik L. Schodt received the 2017 Japan Foundation Awards. 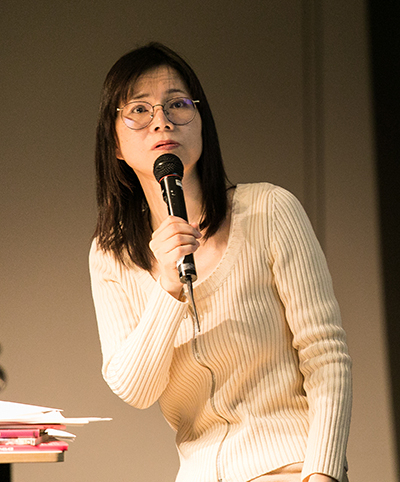 Yukari Shiina is an English to Japanese translator of overseas comics and a part time instructor at the Tokyo University of the Arts in manga cultural theory. She completed her Master of Arts in Popular Culture at Bowling Green State University in Ohio, U.S.A. She is an author mainly on North American comics and the reception of Japanese manga overseas. She also worked as a manga research assistant at the Arts and Culture Division of the Agency for Cultural Affairs for three years. 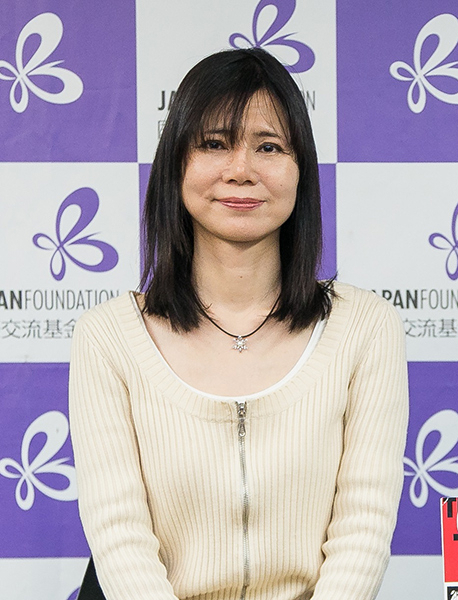 Her translations include Fun Home, a Family Tragicomic (recipient of the Excellence Award in the Manga division at the 15th Japan Media Arts Festival), Black Hole, and Saga. Hungary's First Comprehensive Manga Event: Getting to know the cultural background, drawing the pictures, and learning unique expressions from "manga Japanese"